"UC expert urges Australians to be ‘health prepared’ for disasters"
In late January / early February I participated in a number of media interviews that focused on the need for members of the community to be 'health prepared' for disasters. News headlines on the following stations (January / February): Radio National; ABC 891 Adelaide; ABC North and West SA (Port Pirie); ABC Riverland SA (Renmark); ABC South East SA (Mt Gambier); ABC West Coast SA (Port Lincoln); ABC 612 Brisbane; ABC Capricornia (Rockhampton); ABC Far North (Cairns); ABC Gold and Tweed Coasts (Gold Coast); ABC North Queensland (Townsville); ABC North West Qld (Mt Isa); ABC Southern Queensland (Toowoomba); ABC Sunshine and Cooloola Coasts (Sunshine Coast); ABC Tropical North (Mackay); ABC Western Queensland (Longreach); ABC Wide Bay (Bundaberg); 2CA (Canberra); 2CC (Canberra). 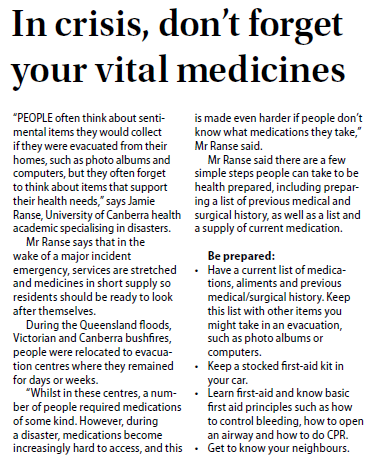 We are used to preparing our homes and belongings for the threat of bushfires, storms and floods in the summer disaster season, but Australians need to be prepared to look after their own health in emergency, according to a University of Canberra disaster response expert. 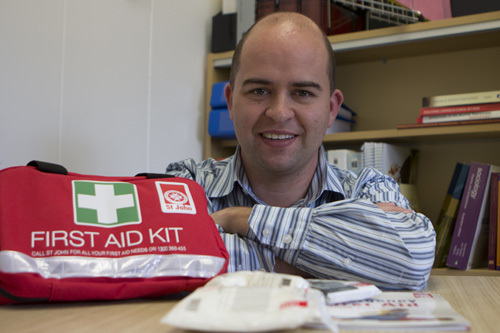 Jamie Ranse, a health academic specialising in disasters, said in the wake of a major incident emergency services are stretched and medicines in short supply so residents should be ready to look after themselves. “People often think about sentimental items they would collect if they were evacuated from their homes, such as photo albums and computers, but they often forget to think about items that support their health needs,” he said. 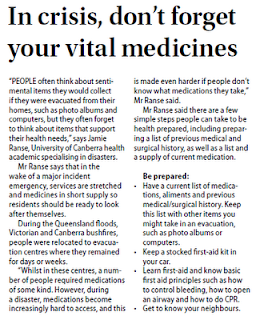 Mr Ranse said during the Queensland floods, Victorian and Canberra bushfires, people were relocated to evacuation centres where they remained for days or weeks.